Part 1 What is The Daily Psalm? Part 2 How Do I Use The Daily Psalm? Part 3 Why Did You Create The Daily Psalm? Part 4 What is the Purpose of The Daily Psalm? Part 5 Why the Psalms? What is The Daily Psalm? Part 1 of the series: The Daily Psalm: What? How? Why? On January 1, 2006 I launched a new website: The Daily Psalm. This website is not meant to replace markdroberts.com. Rather, it is complementary, with a distinct purpose. Though The Daily Psalm is a blog in the most general sense, it is unlike any other blog with which I am familiar. I'm excited about this new project, and want to encourage you to visit The Daily Psalm and benefit from it. So I'm using a couple of posts on markdroberts.com to explain whatThe Daily Psalm is, how you might use it, and why I've created it. If I had to place The Daily Psalm within a familiar genre, I'd say it is a devotional website. It is meant to augment and deepen your devotion to God. Moreover, in form, it resembles some devotional books, though I'm not aware of any that is exactly like The Daily Psalm. And, unlike devotional books, you don't have to take anything with you to access The Daily Psalm. Plus, it's free. Plus, if all goes well, it will continue to be updated for many years to come. As you might guess from the name of the site, The Daily Psalm is based upon the biblical book of Psalms. And, as seems obvious, The Daily Psalm focuses on one psalm each day. Most of the time, the psalm of the day follows in sequence from the psalm of the previous day. So, the psalm for January 1 was Psalm 1, for January 2, Psalm 2, and so forth. The Daily Psalm will take you through the entire book of Psalms, that's 150 chapters, twice each year. This leaves 65 extra days (66 in leap year). On these days I will interrupt the usual order so as to feature a psalm that fits some theological theme that's germane to the day of the Christian year. On Easter Sunday, for example, the psalm will have something to do with new life, resurrection, victory, or some other appropriate theme. The same will be true for the other major days and seasons of the Christian year. (If you're not familiar with this concept, you'll find my series called Advent and the Christian Year to be a good introduction. I'd recommend starting with "Overview of the Christian Year"). The Daily Psalm is a simple website. Below the header you'll find an excerpt from the psalm of the day. This is a verse that has been especially meaningful to me personally. Below this excerpt in the left-hand column you'll find the whole chapter of the psalm. In the right hand column will be a Daily Prayer I've prayed, and written down to encourage you and help you to pray. This prayer is based specifically on the daily excerpt. Along with the prayer there is a Postscript, which is anything extra I want to say about the psalm. It might be a comment on the meaning of the Hebrew text. It might be an application, or a song, or even a picture. Below the Postscript is an invitation to add a comment, a prayer, or ask a question. A link will take you to a bulletin board for the psalm of the day. Or, if you wish, you can link to a place for general comments. My hope is that the comment option will make The Daily Psalm more of a communal experience. The bottom of the page includes some of the things you often find at the top or in sidebars of websites: F.A.Q. page, Links, Syndication, Archive, and other links. I have purposely put these at the bottom so that you can access this site without having to wade through lots of distracting material. My hope is that The Daily Psalm will enrich your relationship with God, and not complicate your life still further by bombarding you with lots of information. In fact, I'm hoping that The Daily Psalm will be a kind of oasis in the World Wide Web, a place of peace and spiritual encouragement. In a way, The Daily Psalm is more of a weblog than many so-called blogs. What you're getting on this site is my daily spiritual journal, literally. The content of the Daily Prayer is, almost always, an edited version of what I have written in my own prayer journal. I have cleaned up my grammar and spelling a bit, and I have edited out things that are too personal for publication. But, for the most part, The Daily Psalm is my invitation to you to join me in prayer based on the Psalms. It's really that simple. In my next post I'll explain some ways you might use this new site. How Do I Use The Daily Psalm? Part 2 of the series: The Daily Psalm: What? How? Why? I'm tempted to answer this question by saying: "Use it in any way that helps you in your relationship with God." Actually, this is my honest answer. The purpose of The Daily Psalm is to help you go deeper with God through regular, prayerful use of the Psalms. My concern, therefore, isn't so much with how you use this site, as it is with your intimacy with God. I will suggest one way to use The Daily Psalm. This isn't necessarily the best way. And it's surely not the only way. But it will help you understand what I envision for this website. 1. Pray for God's peace and blessing as you begin. Ask the Lord to speak to you through the Word and by the Spirit. 2. Read The Daily Psalm portion at the top of the page. This is the passage from the psalm that struck my heart as I read and meditated upon this chapter. 3. Then read the whole Psalm, preferably more than once. Read slowly, allowing the Holy Spirit to speak to you through the Word. The point isn't to race through the text, or even to read it all. The point is to attend to whatever God wants to say to you through His Word. (Yes, this is a version of lectio divina.) If, through this process, a portion of the psalm strikes your heart, then you may want to stop right here and spend time talking with the Lord about what has touched you. 4. Read the daily portion once again. 5. Read my Daily Prayer, which is based on The Daily Psalm portion. You may wish to make this your own prayer. Or you may wish to let this prayer be a jumping off point for your own spontaneous prayer. My hope is that the Daily Prayer will encourage and model for you how to let Scripture inspire and guide your personal prayers. 6. Read the Postscript, if you wish. The content of the Postscript varies. Sometimes it focuses on the meaning of a word or idea in the psalm of the day. Sometimes it includes a brief application or a picture. Basically, it's whatever else seemed good to me to include. 7. Add a question or comment, if you wish. What you write will enrich the devotional and communal quality of The Daily Psalm. When this particular psalm comes around again (in about five months), I may use your prayer as the Daily Prayer, or I may answer your question in the Postscript. I will acknowledge the author of the prayer or question by whatever name you use in the Comments section (real name, nickname, or Guest). 8. If you think of someone who might benefit from The Daily Psalm, you can click to send a link via your e-mail program. So, that's the basic drill. I expect that some folks will become regular visitors to The Daily Psalm, using this website as they would a devotional book. Others will visit for a while and then drop off. I hope they will have taken with them some new insights into how to use the Bible in general, and the Psalms in particular, in their prayers. I expect that others will visit The Daily Psalm occasionally, when they're looking for a bit of inspiration, or when they find that their personal devotions are lifeless. All of this is just fine with me. My goal is not so much to amass a larger readership, as to help folks pray with greater depth and honesty, following the model of the Psalms. I'm hoping that people will visit The Daily Psalm when they need a break from the relentless busyness of the day. If, like me, you spend a lot of your day at the computer, you know how it can feel to be bombarded by information, ads, pop ups, e-mails, etc. etc. I want The Daily Psalm to be an oasis in the spiritually dry wilderness of the Web. Even the design of this site is meant to facilitate a feeling of quiet and prayerfulness. Unlike other websites, including markdroberts.com, The Daily Psalm doesn't overwhelm you with lots of information. Rather, I've highlighted the daily portion of the psalm, and put the whole chapter and the Daily Prayer in plain view. All of the details, the usual stuff of sidebars, I've put at the bottom. If you need it, it's there. 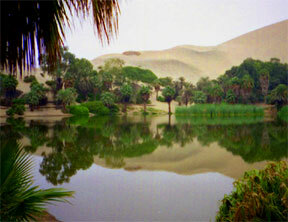 If not, you can enjoy the oasis in an unusual moment of visual and verbal quiet. You may be wondering what motivated me to create The Daily Psalm. This I'll explain in my next post. Why Did You Create The Daily Psalm? Part 3 of the series: The Daily Psalm: What? How? Why? I'm not sure this question is quite right. Did I createThe Daily Psalm? Well, certainly not ex nihilo. Only God can do that. But I'm not sure what other verb to use. Did I invent The Daily Psalm? Or make it? Or produce it? Or fashion it? Or . . . . Oh well, you get the point. 1. What led you to create The Daily Psalm? 2. What is the purpose of The Daily Psalm? I'll tackle #1 today, and #2 tomorrow. What led me to create The Daily Psalm? Well, it certainly wasn't because I didn't have anything else to do! In fact, The Daily Psalm is the result of the convergence of four streams in my life. Given the current of these streams, it seems almost inevitable that I'd be doing this new website. The first stream is The Daily Bible Readings. For over ten years now I've been devising for my church a structure for reading through the entire Bible in two years. Many have shared with me that this has brought new vitality to their faith. So I keep doing it each year, including 2006. "But wait," you might want to say, "aren't there other read-through-the Bible systems, and even Bibles that are structured for reading through the whole text in a year?" Yes, there are many other options. The most common are: 1) the read-through-the-Bible plans that take you through the whole Bible in a year, chapter by chapter, usually with both Old and New Testament readings each day; 2) the liturgically-based reading structure known as the Lectionary, which is used in several denominations (Catholic, Lutheran, etc.). A lectionary-based reading system is closely correlated to the Christian Year, and guides one through the entire Bible in two or three years. It includes less reading than a one-year plan, and the readings tend to be more regularly out of sequence. I don't have any pictures of four streams coming together, but I do have pictures from Three Rivers, Idaho. 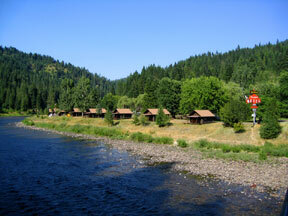 The Three Rivers Motel lies at the convergence of the Selway, Lochsa, and Clearwater Rivers, in Lewis and Clark country. 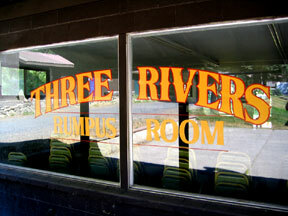 I was happy to discover that the Three Rivers Motel has a rumpus room. You don't find many of these anymore! Note: for more information about The Daily Bible Readings, click here. 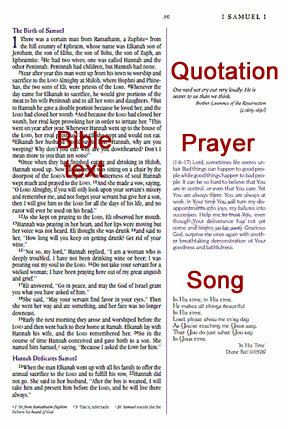 The second stream began with the work I did five years ago on the NIV Worship Bible. For that Bible I wrote hundreds of prayers based on specific biblical passages. As a result of this exercise, I began doing the same thing in my personal devotions. Now, five years later, I've grown to love the practice of "praying the Scriptures" and I want to share this with others. The Daily Prayer posted on The Daily Psalm is simply one of my own prayerful responses to Scripture (slightly edited for publication). The third stream is the Psalms. Four years ago I preached a series of sermons on the Psalms that became the basis for my book, No Holds Barred: Wrestling with God in Prayer. The Daily Psalm is an extension of the mission of No Holds Barred, which is to help folks get to know God better through prayer inspired by the Psalms. I believe that prayerful use of the Psalms will revitalize both individuals and the church. The fourth stream is the Internet. I've been blogging at markdroberts.com for just over two years now. I've been amazed by the response to this site, both quantitatively and qualitatively. In two years I've had over 800,000 visitors from more than 100 countries. Literally hundreds of people have written to express appreciation for my writing. (And, yes, a few haven't been quite so pleased with what I've written!) 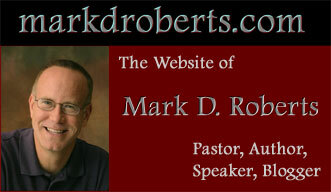 I've discovered personally that there is great power in the Internet to communicate with people today, and my work on markdroberts.com has helped me gain some skill at putting together websites. The Daily Psalm allows me to use my familiarity with the Internet to help people use Scripture - and the Psalms in particular - in their personal devotions. If you add up The Daily Bible Readings, plus the NIV Worship Bible, plus the Psalms, plus the Internet, you come out with . . . The Daily Psalm. This is my new website, active as of January 1, 2006. The plan for this site is simple. I will share with whoever visits this site my own use of the Psalms in my personal devotions. Specifically, I will take a psalm each day and will read it prayerfully. When something in this psalm speaks to my heart, I will write a prayer, as I have been doing for over the past five years. Then I will take this Daily Prayer and the excerpt that touched me, and put these put on The Daily Psalm website, along with the whole text of the psalm for the day and a short Postscript of explanation or reflection. In my next post I'll explain why I have created The Daily Psalm by laying out the purpose for this website. What is the Purpose of The Daily Psalm? Part 4 of the series: The Daily Psalm: What? How? Why? The primary purpose of The Daily Psalm is to help people have a deeper, truer, and more vital relationship with God through regular, prayerful use of the Psalms. It's really that simple. There are two elements in this purpose. One has to do with prayer based on Scripture. The other has to do with the Psalms in particular. In today's post I'll talk more about biblically-based prayer. In my next post in this series I'll share a few thoughts about the Psalms. This website reflects my convictions about the power of Scripture to draw us near to God, especially when we use God's Word to guide and inspire our prayers. The Daily Psalm also reflects my personal experience of praying on the basis of the biblical text, and especially praying the Psalms. In my last post I explained how four streams of my life converged to bring about this website. I saved for this post, and the next, a bit more personal account of how I got to this place. It all began many about ten years ago. At that time I had been a Christian for three decades. Like most Christians, my relationship with God ebbed and flowed. There were times of genuine intimacy, and times when it seemed like God was a million miles away. Sometimes my daily devotions happened regularly and with blessed results. Sometimes I couldn't find the energy to open up the Bible, let alone pray more than a few short syllables. I felt especially guilty about the prayer part, because I believed that prayer was an invaluable exercise of the Christian life. Plus, as a pastor, I was expected to be a faithful man of prayer. So it concerned me that I sometimes found so little desire to pray in private. And, even when I did pray, I tended to rush through my thanks and my requests as if I were in some sort of a race. Then there was the whole challenge of devotional Bible reading. I wanted to read the Bible every day for the purpose of knowing God better. But this wasn't easy for me. In part, my tendency was to want to study the Bible the way a scientist examines something under the microscope – a fine exercise, but not a very good way to get to know God better. I was like a man who, upon receiving a love letter from his wife, focused on analyzing the grammar and vocabulary of the letter, rather than attending to its message. Not surprisingly, my supposedly devotional reading of Scripture often seemed dry and rote, like something I should being doing, but not something I found especially meaningful. Yet I persevered, partly out of a sense of duty, partly out of guilt, and partly because I believed, and still do, that sometimes the life of faith feels like hard work, even though it's actually bathed by invisible grace. In 1998, Buddy Owens, then on the staff of Maranatha! Music and a leader of Promise Keepers, called me to see if I wanted to participate with him in a Bible project. He was working on the NIV Worship Bible, and needed another writer. My initial assignment was to work through the book of Lamentations, writing prayers of worship in response to something on each page of the book. As I did this, I found myself drawn into something more than a writing project. Indeed, I found myself being drawn near to God in a new way. Buddy liked what I wrote, so he began to assign me other books for which to write prayers: Genesis, Hebrews, John, Micah, Nahum, Ecclesiastes, 1 Samuel, 1 and 2 Chronicles, and Amos. For several months I spent many hours a week meditating upon Scripture and writing prayers in response. At times it felt as if I were trudging through deep mud, as when I had 18 pages of genealogies at the beginning of 1 Chronicles, but this was the exception to the rule. More often than not, I found myself interacting at a deeper level, not only with God's Word, but also with God Himself. There were many times when my reflection on a passage of Scripture would bring me to tears: tears of worship, tears of gratitude, tears of confession. This was a new kind of quiet time experience for me. Now there was nothing especially new about this process. It's more or less what many Christians have been doing for centuries to know God better. But for me it was transformational. I soon found myself eager to spend time in Bible meditation and prayer. Sure, there were times when I lacked motivation and missed a few days. But, as never before in my life, I really wanted to spend time with the Lord, marinating in His Word and praying in response to it. This is a page from the NIV Worship Bible. The red labels are added, of course. Every page of this Bible has at least one prayer and one song or quotation. Most pages, like this one from 1 Samuel, have all three items. Since I finished writing for the Worship Bible, I've kept up the discipline of writing my prayers in response to specific passages of Scripture. Though my relationship with the Lord still ebbs and flows, the "ebbs" are less frequent and the "flows" more common. I attribute this to God's grace at work in my life, to be sure. But one of the major ways His grace has worked is through helping me to pray the Scriptures. As I've spoken with hundreds of Christians over the last few years, including many pastors and church leaders, I've realized that my struggle for intimacy with God isn't unique. Many have shared with me how they too find it hard to spend time with God, and how easily they become bored in Bible reading and private prayer. So part of my mission in life has become to help others discover what Buddy Owens once helped me to discover: the fruitfulness of praying in response to the Scripture. What I'm doing with The Daily Psalm, therefore, is more than simply offering my prayers as an inspiration to others. I'm also modeling for others what I have found to be so helpful, in the hope that people might imitate my efforts. Again, please understand that I'm not claiming any originality in this effort. I'm simply passing along one of the blessed disciplines that Christians have used for centuries to know God better. Ironically, this means that The Daily Psalm will be fully successful when regular readers no longer need to visit the site because they have learned to do what I have done. Sure, they might still visit on occasion. But this is one website whose purpose is to help you get to the point where you no longer need to visit. This may not do wonders for my hit count, but that's just fine with me. In my next post I'll explain why I am focusing on the Psalms in particular. Part 5 of the series: The Daily Psalm: What? How? Why? In my last post I wrote about learning to "pray the Scripture," largely through the experience of writing portions of the NIV Worship Bible. In that project I wrote hundreds of prayers in response to many passages from the Old and New Testaments. Yet I did not do this for the Psalms. In fact, ironically enough, the NIV Worship Bible did not include any newly written prayers inspired by the Psalms. Instead, we left a blank column next to the biblical text of the Psalms, encouraging users of the Worship Bible to write their own prayers. In a sense, this website picks up where we left off with the Worship Bible. Why the Psalms? you might wonder. Why not The Daily Gospels? or The Daily Prophets? or The Daily Pauline Epistles? Let me be clear. Any of these others would be fine idea. Praying the Scriptures, wherever they may be found throughout the Bible, is a worthy and fruitful practice. But I have focused on the Psalms because they have particular power to help us pray, and therefore to help us to know God more intimately and truly. After all, the Psalms are prayers. For the most part they address God, though sometimes they speak to people ("Clap your hands, all you peoples;" 47:1), or, in some cases the psalmist even speaks to himself ("Bless the LORD, O my soul;" 103:1). Yet even these psalms are, in a sense, prayers, as they are included in a whole collection of prayer material. The Psalms, therefore, are different from much of the rest of Scripture. Usually we think of the Bible as containing God's words for human beings. The Psalms, however, are human words directed at God. Yet they are not merely human. Christians believe that the Psalms are divinely-inspired. Thus they are human words inspired by God's own Spirit. They are prayers that God Himself has helped to write. Thus the Psalms can teach us to pray in a special way, rather like the prayer of Jesus we call "The Lord's Prayer." God has given us the Psalms, I believe, to help us learn how He wishes for us to communicate with Him. Their purpose is broader than this, but surely includes instruction in prayer. For most of my Christian life I thought I knew and liked the Psalms, but in fact I knew very little of the whole Psalter (the book of Psalms, especially as used for worship). I had memorized certain Psalms, like Psalm 23 and Psalm 100, and knew portions of others. But I had little in-depth knowledge of the whole corpus. In preparation for my Bible Content Exam for ordination, I once read through all the Psalms, but otherwise my knowledge of the Psalter was rather hit or miss, and, honestly, more miss than hit. Yet I knew that many Christians read and prayed through the Psalms on a regular basis. I had a sneaking suspicion that I was missing out on something wonderful by not doing so. 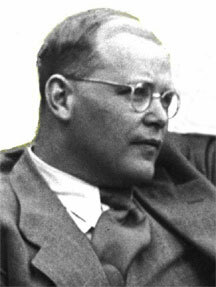 I once had read Dietrich Bonhoeffer's little book Psalms: the Prayer Book of the Bible, so I knew what he thought about regular, prayerful reading of the Psalms: "Whenever the Psalter is abandoned an incomparable treasure vanishes from the Christian church. With its recovery will come unsuspected power" (p. 26). In 2000 I had a three-month sabbatical from my work at Irvine Presbyterian Church. One of my goals during this time of rest was to pray through the Psalms – or at least through about 100 of them, taking one a day. I've written about this experience in my book on the Psalms, No Holds Barred. Here I talk about the surprises, both happy and unhappy, that awaited me as I made my way through the Psalter. In many ways, this experience was transformational for me. So I ended up preaching about it for my congregation, and then writing the book No Holds Barred. My goal was to shared with others the spiritual treasure I had found in the Psalms. Let me repeat, however, what I've said before. My "discovery" of the Psalms was nothing unique. I simply rediscovered for myself what so many other Christians has found before me. In my book on the Psalms, or in The Daily Psalm website, I am not claiming to be particularly original. In fact, part of my point is that what I'm doing is gloriously unoriginal. I'm doing what Christians have done for centuries with great profit. I'm following Bonhoeffer's lead in seeking to help the church recover the "incomparable treasure" of the Psalms. I should like to conclude by saying that the Psalms aren't magic. It's not as if praying the Psalms automatically turns one into a spiritual giant, or instantly opens up a vision of heaven. Genuine spirituality isn't hocus-pocus, nor does it have instant results. There are times, plenty of them, when I read a Psalm and respond with, well, nothing. Other times I read a Psalm and wonder, "Lord, what in the world could this Psalm say to me today?" Sometimes there will be some flash of insight. Sometimes I'll just plod along on the pilgrim's road to knowing God better. Sometimes I'll find myself weeping in response to something in a psalm that touches my heart. Sometimes I'll feel rather bored. But I'm convinced that, over the years, my regular, prayerful exposure to the Psalms has helped me to pray with more authenticity, to be a better pastor, and to know God better. The "unsuspected power" of the Psalms isn't power of the flashy, glitzy, overwhelming sort. It's a quiet power, the power that comes from a truer and deeper relationship with God, the power of learning to come before God's throne of grace with boldness (Hebrews 4:16), the power of God's people joining their hearts together in unified prayer. The unsuspected power of the Psalms is the power of praying in the manner and even the words of Jesus. So The Daily Psalm focuses on the Psalms, not because they're any more inspired than other sections of Scripture, but because they're specifically meant to help us to pray, and because I want to share with others what God has shown me over the years about the power of the Psalms.